Hello, my name is Dan Schlapkohl. I have been the store manager at Ace Hardware – Big Sky, for over 20 years. I started working in the hardware business with store owner (Kevin Barton), back in 1993. At that time, we were a True Value store, located in the canyon, off HWY 191. Approximately 4 years ago, we switched over to Ace Hardware and have loved working under the Ace brand name, and for this wonderful company. As of Dec. 2015, we have a brand new store, at a new location. We increased not only the size of the store, but also our product line and staff in all categories. We now have more than 11,000 sq.ft. of retail space with increased product assortments in all departments, to cover all your hardware and shopping needs. Please come and browse our departments I think you’ll like what you see. You will love our housewares department, Sweet T’s, offering everyday items as well as high end entertaining products such as Le Creuset, Lodge and Shun cutlery. We even have a small deli with daily free popcorn to satisfy your hunger while you search for items in our store. Seasonal products are also available – Holiday Decor is a major department for us. We offer a full line of Christmas items to fill all of your decorating needs. 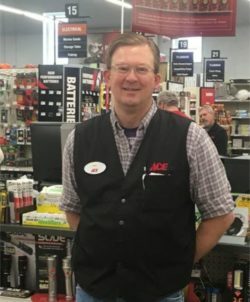 With our new store and experienced staff of helpful people, we strive to make finding things on your list even easier, I’m sure you’ll enjoy the experience Ace Hardware Big Sky has to offer! Come in and take a look around! On behalf of my staff and myself, we look forward to meeting you. 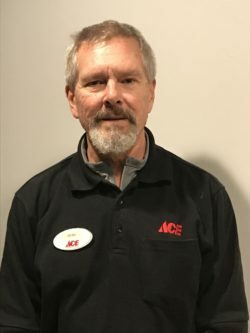 I am the Ace Paint Studio Manager at Ace Hardware – Big Sky. I have 10 years of experience serving Big Sky’s painting professionals and DIY’ers alike. As this store’s leading paint expert, I take paint very seriously, and am proud to introduce you to our Ace Paint Studio. I have countless hours of hands-on experience coupled with many hours of very detailed paint training from one of the nation’s oldest and most respected paint manufacturers in the county – Valspar. 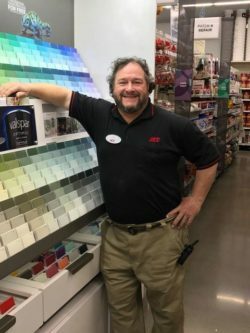 When Ace Hardware partnered with Valspar, Ace created the Ace Paint Studio – the full line paint shop within the Ace Hardware store. This state-of-the-art concept gives us the most current color palette, designed in the best performing brands of paint. Valspar offers zero VOC paints and primers in two exclusive Ace lines – Aspire and Optimus (in my opinion, Optimus is the best interior house paint on the market). Two other exclusive brands found only at Ace, are the Clark + Kensington and Royal lines, rounding out a very complete offering in every category of interior paint. A leading Consumer Rankings Magazine, gave Clark + Kensington a “Best Buy” rating. Valspar Aspire, Ace Royal and Clark & Kensington are available in exterior pain lines as well. Using the Fluid Master AccuTinter, we can custom blend hundreds of thousands of different colors, even if it is a color from a different brand or company. With the MatchRite I-vue Spectrophotometer, we can scan color samples to match your walls if you are just doing paint touch-ups. Ace also carries top of the line interior stains from MinWax and ZAR. Exterior Stains from SuperDeck and Cabots in transparent, semi- transparent and solid body stains. Don’t forget our full line of paint sundries. We have all of the tools needed from the industry’s leading brands – the brands you trust. Purdy, Scotch, Leaktite, and Werner just to name a few. Please stop in to the Ace Paint Studio on your next trip to the store. Ask for me. I’d love to give you a tour of the shop and to assist you with your paint needs. My name is Kelly Scherfig, and I am the Receiving Manager at Ace Hardware – Big Sky. I am also responsible for Helpful Hardware Hub, product management and merchandising as well as sales and deliveries. My other duties include: small engine repair, tool sharpening, screen repair on windows and doors, tool repair and assisting with special orders. When I am not in the receiving room assembling, repairing and ordering product, you will find me on the floor. I enjoy helping customers solve everyday problems, and no situation is too much to handle. If I don’t know how to fix it, I’ll help find a way to resolve the task at hand. Whether it be finding the appropriate light bulb or fabricating a custom bulldozer part, I am always happy to help. I have interest in all types of machines and how they work. This adds to the joy of my job, and enthusiasm to learn more as I am constantly taking seminars and workshops on repair and performance of most any sized engine. I have lived in the Big Sky area most of my life and understand the needs of residents, tourists and contractors. I also have a knack for adapting tools and/or product to our harsher conditions that we encounter here in Big Sky. Being raised in this area has also been instrumental in growing relationships with many local families and allows for a more personalized experience for our customer while shopping at Ace Hardware. I look forward to being able to assist you with your next hardware purchase. My name is Dean Nally. 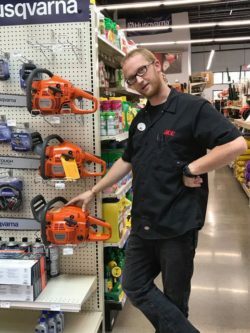 I have worked at Ace Hardware – Big Sky, just under three years. I can be seen riding my bike to work when weather permits, as I never tire of the beauty Big Sky has to offer. I enjoy being a part of this wonderful society, and have been fortunate to call this area home for the past 12 years. In a resort town, such as Big Sky, there are 3 to 4 places everyone visits daily. The Post Office, Grocery Store, Bank and or course, their local hardware store. I am proud to be such an integral part of the community. My role at the store as a department and floor manager is transitioning towards Business to Business liaison. As such, I will be using Ace Hardware’s The Supply Place to enhance the store’s ability to handle our commercial and industrial customers and to supply property management and construction accounts with their complex purchasing needs. This role will allow me to connect on a deeper level, with area industry, offering what I would call a concierge sales experience through our store. Aside from the reward I get through my profession, I enjoy being outdoors; hiking, biking and fishing. I also appreciate the gift of giving of myself and as such, volunteer at the Community Food Bank and for the Big Sky Community Organization – Parks and Trails. Next time you are in the store, ask for me so I can say hello. I am the buyer for Sweet T’s, along with serving as HR and General Counsel for Ace Hardware – Big Sky. Although new to the Montana area, I have more than 12 years of merchandising and brand development experience in giftware for both Lawn & Garden and the Grocery industries. I am delighted to bring my passion for housewares to Ace Hardware – Big Sky. Ace Hardware – Big Sky opened Sweet T’s Kitchen, our housewares specialties department with the grand opening of our new store on December 8, 2015. This signature department is named in memory of Tina Barton Co-founder of Ace Hardware – Big Sky. Tina’s love and excitement for cooking and entertaining can be felt with the details of this new department. From Le Creuset, Lodge and Zwilling JA Henckels, to Riedel Glass and stemware- we have your entertaining needs covered. We also carry a variety of products to make every day cooking a breeze. Come see our USA Brand bakeware, Farberware, Joseph Joseph line and Epicurean cutting boards. We are proud to offer high end knives including JA Henckels and Shun. See also our variety of knife sets, steak knives and everyday utensils to add to your collection. Want toast, tea or coffee in the morning? We have everything you need to start the day off right! Running late? We have a complete line of Yeti or fifty fifty insulated beverage containers sure to keep hot drinks hot, and cold beverages icy for hours and hours. Our new focus is also on giftware. Whether a hostess gift, birthday, anniversary or just because, we have everything from the gift to the gift wrap to cover your needs. We truly are your one stop shop. We invite you to come and see our displays and walk up and down the aisle at Sweet T’s. Whether man, woman, or child- there is something for everyone. Feel free to ask for me next time you are in the store- I’d love to show you around!